Wind your way slowly from Armidale to Coffs Harbour along the spectacular Waterfall Way to take full advantage of all the natural, cultural and heritage delights. This is your personal itinerary on what not to miss in Armidale and along the Waterfall Way. For a scenic drive that covers just over 200 kilometres, New South Wales’ Waterfall Way offers road trippers a diverse range of spectacular natural landscapes complemented by cultural interludes and heritage wonders. Ten years ago we voted it third in our rundown of great Australian drives, and we stand by this today. Start by exploring the picturesque university city of Armidale in the New England High Country, before wending your way to the coastal city of Coffs Harbour via bucolic countryside, sweeping valleys, wilderness, gorges, World Heritage-listed rainforest and of course waterfalls: including Australia’s second highest. Here’s what not to miss in and around Armidale and along the Waterfall Way. For another perspective on the city’s heritage, visit the White family’s summer residence, just a little north-west of Armidale’s CBD: the grand country house Booloominbah was built in the 1880s and – still part of the campus today – was to become the original site of the University of New England, Australia’s first regional university. Set high within the Northern Tablelands, Armidale is on the doorstep of the World Heritage-listed Oxley Wild Rivers National Park and much of the region’s stunning gorge country: where the pretty, pastoral landscape that lives up to its New England name drops away to reveal deep gorges and views to rival the Blue Mountains’ for beauty and drama. To get a taste of it all, head 17 kilometres south of Armidale to Dangars Falls within the national park. You don’t need to stray far from the picnic area to get scenic views of the falls and gorge country, but a six-kilometre round trip along McDirtys walking track will provide a range of spectacular perspectives and the chance to spot kangaroos and all manner of birdlife. Head east out of Armidale along the Waterfall Way for half an hour to arrive at Wollomombi Falls within Oxley Wild Rivers National Park. Dramatically plunging 220 metres into the valley, this is New South Wales’ highest waterfall and the second highest in Australia. If you’re up for an adventure you can descend the short but steep Chandler walking track into the valley or alternatively take the Wollomombi walking track, an easier four-kilometre return walk around the rim of Wollomombi Gorge, for optimum waterfall and wilderness views. Forty minutes’ drive further will bring you to one of Australia’s most spectacular lookout points. Located within the World Heritage-listed New England National Park (protected for its expanses of Antarctic beech rainforest that give a glimpse of what ancient supercontinent Gondwana would have looked like), this spot allows a panorama of unspoilt wilderness, with views across to the Bellinger Valley. On a clear day you can even see out to the Pacific Ocean. Back on Waterfall Way, it’s just a few minutes up the road before the turn off to Cathedral Rock National Park. Here, the star attractions are the striking granite tors, or boulder piles. Get active with a hike and scramble to the summit of main boulder piles Woolpack Rocks (an eight-kilometre return) or Cathedral Rock (six kilometres return), where you can look out to the wilderness of dry eucalypt forest, granite outcrops and wide-angle views of the New England Tablelands. Alternatively, take the leisurely one-kilometre Warrigal circuit track through dry woodland and ancient boulders. If you’re looking to pitch a tent for the night, Cathedral Rock is an ideal place: Barokee campground offers camp spots secluded among the banksias and eucalypts; Native Dog Camping Area is nestled among myrtle tea trees and lemon bottlebrush. 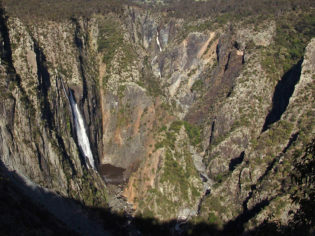 Just beyond Cathedral Rock National Park, Ebor Falls offers another spectacular series of waterfalls to ogle: cascades of water that come tumbling down the Guy Fawkes River at two separate spots. 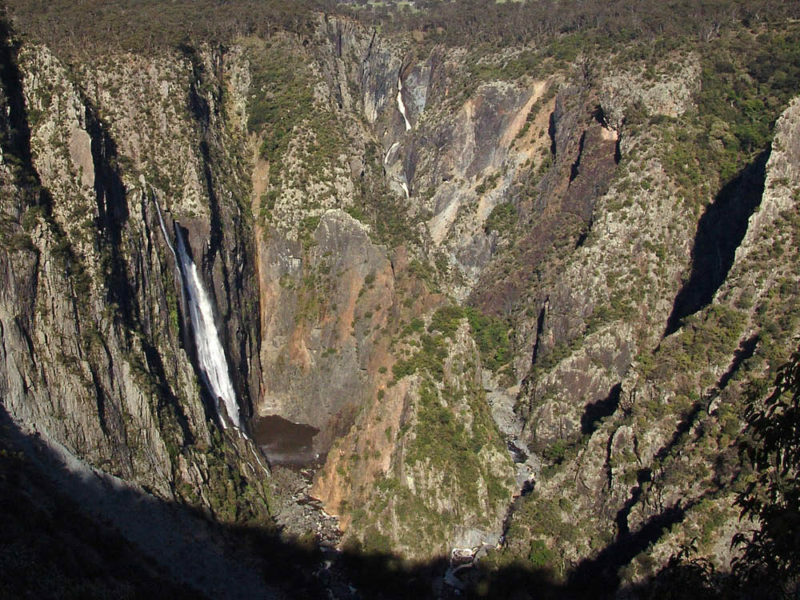 An easy walking track along the escarpment edge links these upper and lower falls, and viewing platforms offer stunning views of both falls and out into the rugged gorge country. Edging closer towards the coast and at the cusp of the Great Dividing Range, the small rural town of Dorrigo is the gateway to the ancient rainforest and dramatic waterfalls of Dorrigo National Park. And just over one kilometre north of town lies Dangar Falls (not to be confused with Armidale’s Dangars Falls; both are named after 19th century surveyor and pastoralist Henry Dangar). It’s a smaller, picturesque falls set within scenic agricultural and dairy farmland, and ideal for a stretch of the legs and a dose of negative ions. Starting at 730 metres above sea level and ending at 15, the 30-minute drive from Dorrigo to Bellingen takes on steep and winding proportions as it spirals down through rainforest, past waterfalls and along the Bellinger River. The vibrant and bohemian town at the end is packed full of funky eateries within its heritage streetscape. Check out Cedar Bar and Kitchen, located in an old timber church and the Bellingen Brewery & Co., in an old converted old factory. A year-round roster of markets, festivals and events further energise the town. If you want to linger here longer, Bellingen has plenty of great accommodation options in town and on its periphery: from motels, cabins and weatherboard cottages to (more) converted churches and rainforest retreats. Splinter off south-east from the technical end of the Waterfall Way to find the town of Urunga, just under 30 minutes down the coast from Coffs Harbour. Here, stretch your legs with a walk along the one-kilometre Urunga Boardwalk: an elegant intervention on the beautiful natural landscape of salt marsh and ocean. Soak up stunning views both out to the Pacific and inland, back the way you came, up to the river valleys and Great Dividing Range.